This year’s placement season at Faculty of Management Studies (FMS), Delhi University has recorded hundred percent placements for the 2014 batch. In a batch of 217 students, 205 students opted for placements. A total of 212 job offers were received, with each student at least bagging one placement offer. The highest package offered is of Rs 61 LPA (Lakhs Per Annum) whereas the average package is Rs 16.18 LPA. FMS has managed to clinch a salary same as that of Indian Institute of Management, Bangalore. Last year, the highest salary at FMS was Rs 60 Lakhs Per Annum. A total of 107 companies participated in the placement process with 37 first time recruiters. Also, seven students opted out of placements and are pursuing other career pursuits such as entrepreneurship and civil services. While retaining its reputation as the marketing campus of the country, this year’s placement process witnessed a healthy participation across all domains such as Consulting, General Management and Finance. However, the hottest sectors this year were BFSI (Banking, Financial Sector and Insurance) and Information Technology. Videocon offered a niche profile of Deputy General Manager in Consulting sector, whereas, Zomato offered a position of Assistant Vice President in Operations. An array of International banks such as Deutsche Bank, JP Morgan Chase, HSBC, Bank of America also visited the campus. In addition, Indus Balaji and SBI Captial Markets were the few Indian firms which offered jobs in BFSI sector. Globally reputed companies such as Coca Cola, Microsoft, Google offered various jobs in Operations and IT sector. Hindustan Unilever Limited (HUL), Procter & Gamble (P&G) and ITC were among the most popular companies in FMCG sector. “FMS as a business school is competing with all the IIMs. When looked at all rankings, we are always placed in the top ten. 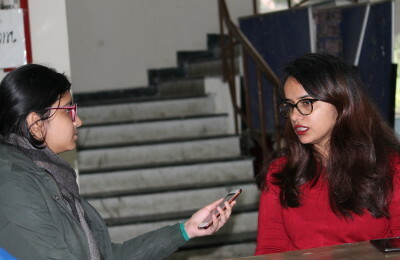 It is really great that a faculty of Delhi University is doing so well nationally.” says FMS Placements Convenor Dr. Mala Sinha. Previous PostSex Amma : I think my boyfriend is turning 'straight'! Next PostToo old for toons? abhinava@dubeat.com; A workaholic second year commerce student and a public speaker, debater and an avid traveller, Abhinav likes calling himself ‘a jack of all trades’. You will always find huge variety of newspapers and journals in his backpack. Being a biking enthusiast, you’ll find him roaming in the NDMC area on weekends, with his camera hung around his neck. He aspires to be a Broadcast Journalist.